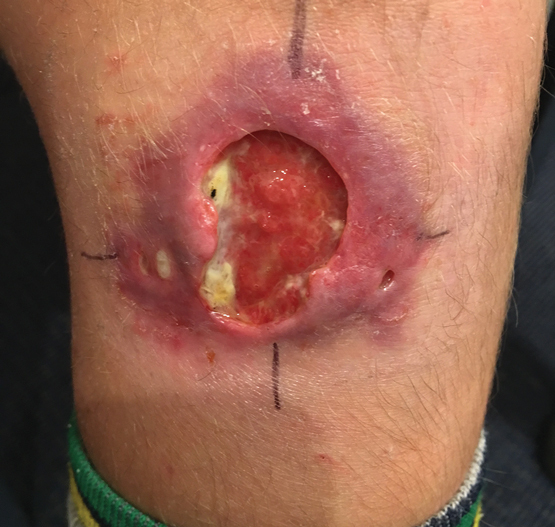 Photo Credit THE MEDICAL JOURNAL OF AUSTRALIA A mysterious and 'nasty' flesh-eating bug is spreading at unprecedented levels in Victoria, and experts don't know how to stop it. Researchers are appealing for government funding so they can figure out how to contain the bacteria, which causes a disease called Buruli ulcer. Most commonly found in tropical Africa and usually associated with stagnant water, it can have devastating impacts on sufferers, including long-term disability and deformity. Cases have been reported in the Daintree and, less commonly, the Northern Territory, NSW and Western Australia. But most are from Victoria where there's a worsening epidemic, including 182 new cases in 2016, 275 in 2017 and 30 so far in 2018. There were fewer than 100 cases in 2012. "It's pretty much tripled over the last five or six years," Victoria's deputy chief health officer Brett Sutton told reporters on Monday. Cases are also becoming more severe and occurring in new areas, but efforts to control the outbreak have been thwarted because it's not known how humans become infected, a study published in The Medical Journal of Australia says. Native and domestic animals, including dogs, cats, possums and koalas, have all developed the disease, but it's unknown whether they spread it. "As a community, we are facing a rapidly worsening epidemic of a severe disease without knowing how to prevent it," researchers said in the report, appealing to all levels of government for urgent funding. The federal government has so far provided $2.4 million and the chief medical officer will work with Victorian authorities on new research strategies, a spokesman for Health Minister Greg Hunt said. Victoria has provided close to $1 million over the past decade, with $150,000 going toward current work, including an analysis of possum faeces and testing of mosquitoes, which have been shown to contain the bacteria. The state's health department and researchers have also applied for a grant from the National Health and Medical Research Council and will contribute $250,000 if it is successful. "Sometimes it's seen as a Victorian issue, but it's also happened in the Daintree," Dr Sutton said, urging the council to consider the application. "The things we can develop here in Victoria out of research have implications more broadly." Most cases are occurring on the Mornington and Bellarine peninsulas, but there is a risk the "nasty disease" could spread to other coastal areas, possibly through possum faeces, Dr Sutton said. The infection seems to happen more in warmer months and bites or trauma to the skin may play a role. It can take anywhere from four to six months after exposure for a person to display symptoms, which may start as a red, raised area. The ulcer can be treated with antibiotics, but patients end up paying about $14,000 each because the drugs are not covered by the Pharmaceutical Benefits Scheme and many sufferers also require plastic surgery.